Jeanne Linneweever is one of the leading international Dutch riders. Last year she was 30th on the open FEI rider rank, 8th on the FEI open combination rankings with her horse Riki's Macho Man. Jeanne started riding when she was young, competing in dressage and jumping. In 1994 she and her husband Charles went to the World Endurance Championships in The Hague in Holland, where they saw the galloping finish of the 160 km ride with America's Valerie Kanavy on Pieraz in the stadium. Jeanne decided that was what she wanted to do! And since she was getting a little tired of the show world, she did just that – switched to endurance! At home she had a Haflinger pony, Storm, that she'd been doing dressage and jumping on (quite successfully), and he became her first endurance horse. 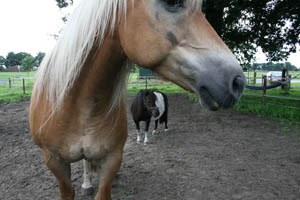 Their first ride was in Hottenberg Holland in 1994. For 5 years they did endurance rides together, up to 80 km. Storm is big and golden with a blond mane and tail, and people always recognized him at rides - “hey, there's Storm!” - though not necessarily always Jeanne on his back! He was really too big for fast endurance riding though – big boned and wide – so she had her eyes out for another endurance mount. Through the Dutch endurance club she'd joined, she met Eric and Anita Lamsma, who live in the area. 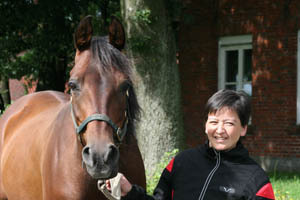 Anita rides endurance, and her husband crews and organizes the Dutch Championships every year. Anita had a horse she wasn't getting on with well in 2000, so she asked Jeanne to ride him. Riki's Macho Man was off the racetrack, and at first he was a tough horse. 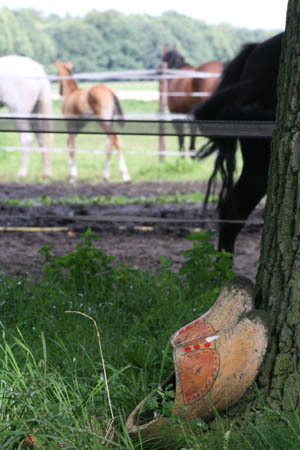 He was a bit crazy, was not used to riding out on trails, would sometimes panic, and was quite spooky. He broke a few of her bones – a few times. Once Jeanne even thought of selling him, but something told her he would be a nice horse. Jeanne and Macho completed their first 160 km in 2004, and now they've finished 5 160 km rides. They finished 26th in the 2005 European Championships in Compiegne, France; 16th in the 2006 World Championships in Aachen, Germany; and second in this year's Dutch championships at 160 km. We may see them this year's European Championships in Portugal. In addition, they have been invited to compete in the 2007 Pre-World Championship ride in Malaysia in November. That will be a hard decision for Jeanne and Charles to make for several reasons, not the least of which is it's a long way getting there, and Macho is not the easiest of travellers. 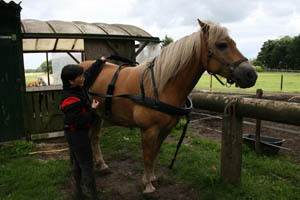 He does have a companion Shetland pony Julia that he travels with, and that does help to keep him calm. Malaysia is a tough country to ride in – tough on the horses and tough on the riders with the hot and humid conditions. But the challenge still calls. Now 14 years old and a pro at endurance, Macho can still be a handful; he'll still spook on training rides, and twice he's dumped her off at the finish of rides – though that's been a few years ago now. He's usually all business in a ride (though he gets bored on flat rides with repetitive loops, and he'll be spooky on rides if they're only 80 km – and he knows when he's only doing 80 km! ), and sometimes he doesn't care to slow down, like on a few hazardous parts of the trail in the mud at Libramont last weekend! Though Jeanne still takes dressage lessons, and all her horses get worked in dressage, she's happy to have left that world behind, and to be doing endurance. She loves the opportunity it gives her to travel around the world and meet people from different countries doing the same thing. It is hard, though, when you have full time jobs to support your endurance habit, which is a full-time job in itself! 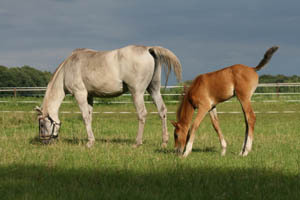 Jeanne and Charles have 2 broodmares, one Adria with an adopted foal by her side (not their own) and scheduled to be bred, and the other Elana, having just been bred. They have 2 yearlings with a friend further north in Germany. 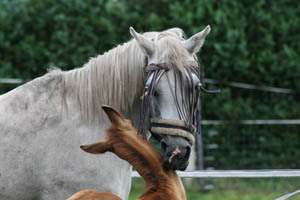 The foal at Adria's side is by an Akhal Teke stallion – we'll look at Akhal Tekes next story – and owned by the stallion's owner Urte Kern. Urte may convince Jeanne to try out an Akhal Teke for endurance, so this youngster currently galloping in the paddock and terrorizing his mother (he chewed off most of her tail!) may one day be under saddle under Jeanne, going down the endurance trail!